In Development as a Featured Film! ALA YALSA Reader's Choice Award Nominated Worldwide Bestselling YA Fantasy Series5 out of 5 stars - "Anyone that loves faery tales should love this." - Heather, Buried in Books5 out of 5 stars - "Bitter Frost is like Percy Jackson, The Narnia Chronicles and Twilight combined." 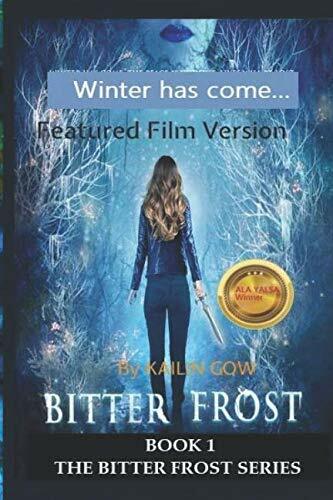 - Your Average Bookworm5 out of 5 stars - "Kailin writes beautifully and weaves a magical tale that you won't forget...Bitter Frost had so many elements that I did find unique." - Krisina, Cajun Book Lady 5 out of 5 Stars - "This book had it all action, adventure, mythology and history." Paula, Goodreads5 out of 5 Stars - "I fell in love with the series right away and the beautiful scenary that the author desscribed in the fae land- it has a lot of unexpected twists and turns." - Henrietta Mendozza DESCRIPTIONAll her life, Breena had always dreamed about fairies as though she lived among them...beautiful fairies living among mortals and living in Feyland. In her dreams, he was always there the breathtakingly handsome but dangerous Winter Prince, Kian, who is her intended. When Breena turns sixteen, she begins seeing fairies and other creatures mortals don t see. Her best friend Logan, suddenly acts very protective. Then she sees Kian, who seems intent on finding her and carrying her off to Feyland. That's fine and all, but for the fact that humans rarely survive a trip to Feyland, a kiss from a fairy generally means death to the human unless that human has fairy blood in them or is very strong, and although Kian seemed to be her intended, he seems to hate her and wants her dead.The Frost Series(TM)Forever Frost Silver Frost Frost KissesMidnight FrostFrost FireSpring FrostEnchanted FrostRing of IceThe Fairy Letters: Letters from Winter Prince Kian to Breena]Visit Sparklesoup.com for More Information!